On the distinctive and renowned beach of Kamari lies Atalos Villas which can extend hospitality to you in its comfortable and pleasant environment and make your vacation unique and unforgettable. In Atalos Villas you will enjoy your vacation on a family environment learning about traditional Santorini, swimming either in the wonderful beach of Kamari, or diving into the pool of the complex. 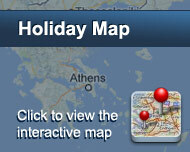 Atalos Villas is located just 200 meters from Kamari beach and has 34 apartments and studios with a pool and a bar. Είστε ιδιοκτήτης ή διευθυντής στο ATALOS VILLAS; Εγγραφείτε τώρα για δωρεάν εργαλεία, που μπορείτε να χρησιμοποιήσετε για να βελτιώσετε την καταχώρησή σας και να συνδέσετε την ιστοσελίδα σας και το σύστημα κρατήσεών σας.